Your vehicle’s coolant flows through the engine to keep everything running at the appropriate temperature. Coolant, also known as antifreeze, is mixed with water in the radiator at a precise ratio to create radiator fluid. The chemical fluid prevents the water in the engine from freezing on cold days while at the same time preventing the engine from overheating. 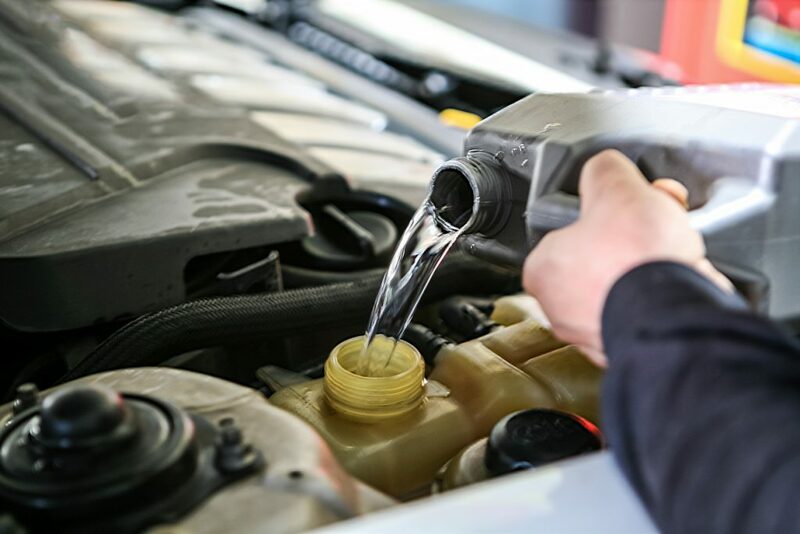 Coolant is a vital component in your vehicle – if something goes wrong with it, your engine is at risk which is why it is so important to have your coolant checked regularly. Just like the exterior of your vehicle can rust if not cared for over time, the components inside your cooling system can begin to rust. When the coolant becomes spent or contaminated, the harsh fluid can accelerate the rusting and oxidation process as it flows through the engine. Prevent rust from growing and spreading by having your coolant periodically flushed and replaced – at least every two years. When fluids age, their pH balance can shift. When coolant or radiator fluid becomes too acidic, it will begin to eat away at the delicate components in the cooling system. Rubber parts and seals will be facing the biggest threat, with the hoses, gaskets, and heater cores at risk. Acidic fluid can even damage the radiator itself! Contaminants, rust, dirt, and debris can collect in your vehicle over time. If these contaminants get into the cooling system, it means big problems for your engine. The radiator fluid can leave deposits behind as it flows through the system. Deposits of contaminants or minerals (especially if the antifreeze becomes alkaline) can clog the system, prevent the fluid from reaching every part, and lead to break downs in the cooling system. Don’t wait for a big problem to occur – make sure you have your coolant inspected regularly, with every oil change. If you notice a change in your vehicle, especially a rise in the engine temperature, bring your vehicle in to Chase Automotive right away for an inspection. Our ASE-Certified technicians will keep your fluids clean, fresh, and performing at their best to keep you safe on the roads in Aurora. Call (303-344-4670) or click HERE to schedule your next appointment.